We were driving in the car recently and my son asks, "what would happen if snake came out of your mouth every time you burped?" I think a normal parent would have reacted much differently than I did. "What kind of snake?" I ask. "Well, if you burp once, a spitting cobra comes out. If you burp twice, a king cobra comes out." "What happens with the cobras when they are out?" "The cobras will do whatever you say or just follow you around for a while." "If you burp a lot, do you get a lot of cobras? "No, you can only get three cobras no matter how many times you burp." "What if I burp three times?" "Nothing. One burp is a spitting cobra, two burps are a king cobra." Thus we have the belching snakes spell for Swords & Wizardry or your favorite retro-clone. The caster begins belching loudly in bursts of one or two belches. 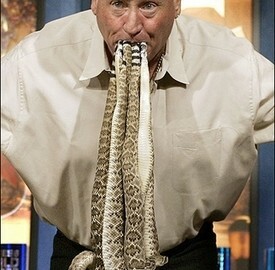 If the caster belches once, a spitting cobra appears. If the caster makes a two belch burst, a king cobra appears. The snakes follow commands, but wander off at the end of the spell. If killed, they disappear into nothingness. Spitting Cobra: HD 1; AC 5; Atk 1 bite (1hp); Move 16; Save 17; AL N; CL/XP 3/60; Special: Spit poison, 30' range (Save with +2 bonus to roll or go blind for 2d8 turns). King Cobra: HD 2; AC 5; Atk 1 bite (2hp + poison); Move 16; Save 16; AL N; CL/XP 4/120; Special: Lethal poison.